Have you figured it out yet? It took me a while. ‘ACIREMA’ is America spelt backwards; this exhibition, curated by Cesar Garcia, takes as its conceptual motif the famous drawing by Uruguayan artist Joaquín Torres-García of South America upside down. América Invertida (Inverted America) (1943) does not feature in the exhibition. Instead, curator Garcia has convened eight artists from South and Central America born since 1980 who, he argues, ‘actively challenge the conventional framing and contextualizing mechanisms through which their practices are often situated’. Garcia has set himself a high bar. To contend, as he seems to, that these artists reject US- or Eurocentric models of artistic activity in favour of subjective, localized perspectives is to make grand claims for their work’s innovation. In fact, certain of these artists owe a great deal to artistic forms from outside of Latin America. That, of course, is no crime, and one that the artists themselves would surely acknowledge. Jose Antonio Vega Macotela, for instance, makes art which traffics in the non-financial currencies of daily life. 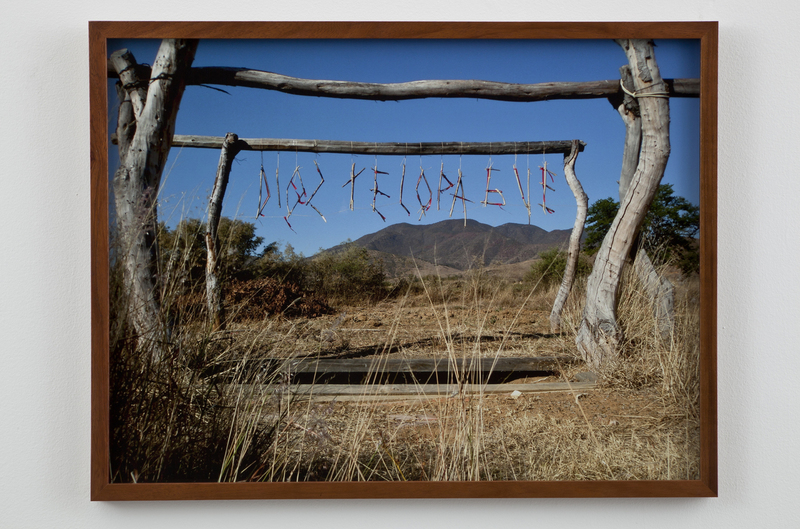 For his project ‘Time Divisa’ (2006-10), he exchanged his own time with that of Mexican prisoners. Next to framed collages, a notice reads: ‘In exchange for going to Huautla, Oaxaca, to search for Samuel’s daughter door to door, Samuel cut the pages of an art history book vertically and horizontally in order to weave them together; connecting interconnected hybrid images.’ The resultant collages are relatively unremarkable – fine, but hardly original – but what makes the project compelling is its tough, real-world relation to the generic contemporary art that it resembles. Perhaps that is Macotela’s point: to contrast time well spent and time wasted, and to map that contrast onto differences in personal freedom. The dejected paintings of Tomas Fernandez, executed in muddy tones on scraps of torn and cracked boards, recall the Euston Road miserabilism of British artists Leon Kossoff and Frank Auerbach, as well as that of certain contemporary Romanian painters. It is a surprise to see this Chilean artist absorbing and repurposing such histories, even if the outcomes seem oddly familiar. Edgardo Aragón’s photographs of enigmatic phrases written in twigs out in cartel-ridden Mexican backwaters look at first like colourful Shannon Ebners. However, it is easy to imagine Aragón’s messages – such as ‘no moriras’ (‘you will not die’) – spooking superstitious locals who encounter them after the artist has left the scene. Coincidentally or not, many of the works were serialised. Firelei Baez’ grid of 28 gouache drawings were titled Can I Pass? Introducing the Paper Bag Test to the Fan Test for the Month of February (2011) ­– a record of the artist’s changing hairdo and an allusion to out-dated methods of racial profiling. Cesar Gonzalez’ wonderfully strange drawing Fierces (2009) repeats a changing pattern of mythical figures across adjoining sheets of brown paper. I have no idea what these strange creatures signify, nor do I care; like the best work in ‘ACIREMA’, Fierces keeps its referential cards close to its chest.